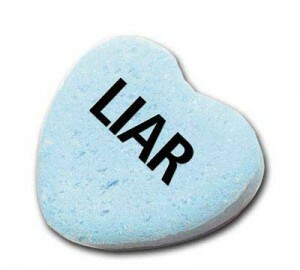 Karen DeLabar » Blog Archive » Liar, Liar, Pants on Fire! Growing up I was known to be somewhat of a storyteller. Actually, they didn’t even sugarcoat it with that, they called me a straight out liar. You have to understand, I needed attention. Ok, that sounds a bit pretentious. I mean, there I was the youngest, the only girl with three older brothers and I had the cutest, curliest red hair imaginable. There’s no doubt I had any problems getting people to notice me. However, once I had their attention, I needed to keep it. From a very young age I learned how to read people. I can tell when someone is interested in what I have to say and I learned when to pull back from a story or push through. It wasn’t easy; I got caught lying a lot growing up, but I like to think over the years I pulled a few doozies over people that to this day they don’t know about. And for that, I’m extremely embarrassed and ashamed. You see, as I got better, the lies got more extreme. It became almost a game to me; who could I trick, who could I get to believe me? Don’t get me wrong, I didn’t only use it for evil, it helped me immensely with acting and I pull it out when I write, what writer doesn’t? A few years ago my family went through a tough time. I have three older brothers, whom are all married, and it seemed like no matter what you said or did, someone was always mad at you. Facts got twisted and my family was embroiled in a vicious game of “He Said. She Said. Then He Said That. And OH MY GOD Did You See The Look She Gave You?” It wasn’t pretty. I want to say that I was mature enough not to use my dramatic flair against my family, but I can’t. For awhile I felt like the family turned against me, and in truth, they kind of did. My marriage was young, and by that I mean, only a few months, and my husband had yet to find his place in my family so he left the defending up to me. I admit that hurt. My entire life I had to stick up for myself against my brothers and now they had reinforcements in the form of a loving spouse and I was left alone. So I resorted to my one trick, the one thing I knew I could rely on, storytelling. I would twist words and actions and tap dance my way around sticky situations in order to get people to see things my way. Sometimes it worked, other times it backfired but luckily for me and my conscious after a few months, I got tired. Dancing with yourself isn’t as fun as Generation X (and Billy Idol) made it sound. In fact, it’s quite lonely. Eventually things ran their course and thankfully we landed on civil ground but when I look back at that time I realize how quickly things would have been fixed if I just told the truth. No matter how difficult, no matter how much it hurt me or the other person, if I would have just been open and honest about the way I felt then maybe it wouldn’t have been as drawn out. I turned a new leaf after that. I started telling people not only when they made me sad or angry, but when they made me happy, too. It was during my family’s civil war that I realized that life is too damn short to go through it fighting with people, especially ones that are supposed to be in your corner. I also learned that hiding the truth, or lying by omission, is just as bad, if not worse. Be a man, or a woman, and own up to your feelings. Why hide them? They’re yours, own them. It’s true that my relationship with one of my brother’s is still a bit broken and after years of trying to fix the mistakes I’ve learned that they may not be ready to let go of past transgressions. Since I can’t control him I had to learn to how to move on without him as a part of my life. I thought I had learned all the lessons life had to teach me about telling the truth. After all, we learn at a very young age that you should tell the truth, surely by 30 I should have it down pat. But I didn’t. See, I learned the importance about being honest with others, but I had yet to learn the importance of being honest with yourself. That was a truth most hardest to learn. But in all of that I wasn’t doing that for me, I was doing that for them. I denied my happiness to make others happy. Things were happening in my life that I felt deep down in my gut weren’t right, but I ignored it. I lied to myself. I didn’t trust my instincts because I didn’t want to see what really was in front of me. Not only did I have to get over the hurt of people lying to me, but I had to get over the devastation of realizing I was lying to myself. That is one mistake that still pains me to this day. After all of this I can’t say that I don’t lie, that’s just ridiculous. 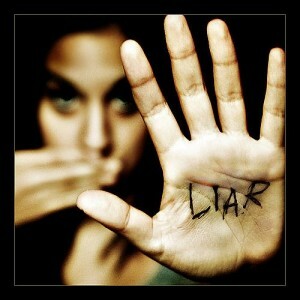 It’s human nature, we all lie, especially if you have kids. But when it comes to the important things, someone’s heart, someone’s ego, someone’s work, yeah, I’ll tell you the truth, you can count on it. And in a world where we’re running out of things to count on, I think this one is pretty damn special. This entry was posted on Tuesday, March 6th, 2012 at 9:43 PM	and is filed under Blog. You can follow any responses to this entry through the RSS 2.0 feed. You can leave a response, or trackback from your own site. This one hits home with me for a number of reasons. You know that. Just this week, I made a serious mistake, a horrid lapse in judgement, and had a choice to make: run & hide from it (which would’ve been very easy to do in this case) or come clean, fess up, & own it? I chose to be honest. It was the right thing to do, & I owed this person that much for what they’d meant to me. It was terrifying. I wrote the letter, explained myself as best I could, grovelled, apologized, & left them in peace. I hit Send on the email & burst into tears. I’ve probably lost that friendship. But at least I was honest. I’ve always been honest, to a fault. But now I really know the meaning behind the saying, “The truth shall set you free”, because even though I fucked up, the one thing I can say is I was honest, and that self-respect will help me move forward. Being honest with yourself is often hardest of all. I’m sure even writing this post was emotional for you, much less posting it. That took guts. But Karen, the truth shall set you free. So keep on keepin’ on, girl. If we keep learning about ourselves, about how to muddle through life, we grow & are better for it, even if we don’t see how right away. This post is more self-aware — more HONEST — than most people are in a lifetime. Good for you. P.S.I love you a lot. Wow, so apparently my site makes everything HUGE when you put # in front of it! LOL. But, thank you, Jesse. I appreciate that! Jen, I know what you’re talking about and you know I respect you more for how you handled that situation. Your words brought tears to my eyes. It was hard to write this post and I know some people view blogging differently than I do, but when it comes down to it, this is my space to share whatever I feel is share worthy. I want people to know that honesty is one of the most important traits to own. People make mistakes, we lie, we cheat, we steal, and when we cave to those seductions and temptations it’s on us to own them. So, I am. It’s still not the easiest, but it’s time to be true to myself and those around me. We all deserve that. Great post. I had a similar childhood. Only child until 15. Had to entertain myself by making up fantasy worlds full of dinausors and Vikings. Serves me well now in my writing gig. Even though I had three older brothers, the youngest of which is five years older than me, they wanted nothing to do with me. So to entertain myself I slipped into my own world. My grandparents loved watching me because I could occupy myself, unfortunately I had a tough time pulling myself back into reality and I paid for it when I got older. Luckily, I’ve learned my lessons and I’m ready to step forward with the truth. But yeah, when it comes to writing, I can slip easily into another life because I have that trait, so it’s not all bad. Thanks for the comment, Reggie! No computers were harmed in the 0.205 seconds it took to produce this page.